The Reel Talent slot is the result of the collaboration of company Just For The Win’s and Microgaming’s Quickfire platform. The slot invites players to take part in the battle of talents and fight for their place on the big stage. The slot has a high-quality graphics and interesting functions. There is a bright talent show, where the main roles are played by animals with different abilities. After going through several stages of the competitive program, you can count on solid winnings, especially at the end of performances. Visually, the gaming machine Reel Talent is even more consistent with the name, due to the use of the background and the animals as symbols. Together with the pictures of the props, they make up the winning lines from left to right. To make such cases more frequent, a universal Wild has been added to the slot, which replaces others. Assessing the potential of the slot Reel Talent in betting on money, we should take into account the cumulative system of launching functions. Thus, slot participants need a sufficient amount of a bankroll and the right strategy in the long run. The Reel Talent slot has five spinning reels and 20 paylines. 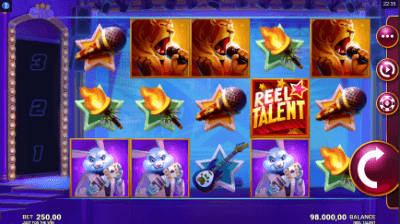 On the screen there are symbols corresponding to the main theme of the game: microphones, guitarists, singers, white rabbits, showing magic tricks, as well as the logo of The Reel Talent. The slot drums are set on a blue background. The game is equipped with sound and visual effects that are activated in case when the combination brings a win. It is important that is a online slots with the highest frequency of major victories in the JFTW developer portfolio. For this, the developer offers several bonus features. The percentage of return to the player - 96.03%. The basic addition of the characteristics of this gaming machine are repeated spins. To launch them, it is enough to collect any combination of identical symbols. The type of name participating in it will be filled with a special bonus indicator, where you need to collect three pictures in a row. Symbol Storage function will collect one symbol after each victory to reward the player with a Superspin bonus round. If the Superspin brings the next victory, another character is added to the “vault”. If a gamer gets a winning combination during the third re-spin, the third and last symbol are added to the symbol store, then the next bonus function is launched. There are three different bonuses that depend on the combination of the collected characters. Three different icons take players to the Superspin Showtime, where the drums are filled with just these three pictures. The Big Stage Superspin is launched if two different icons are stored in Symbol Storage. If the gamer managed to collect three identical pictures, the Superspin Solo Performance bonus is activated, where all the reels are filled only with this symbol. This guarantees a big win. The new online slot differs from other games of the collection by the bonus system. In addition, there is a fascinating story and a unique gaming experience. Also, the Reel Talent slot offers all the players frequent big wins, a lot of bonuses in the base game, as well as unique features that not every slot can boast. Do not deny yourself the pleasure of trying your luck.